“Spitting Spreads TB. Don’t Spit”. Seeing a bumper sticker with that phrase was the first thing that made me laugh after sitting in 15 minutes of silence leaving the Mumbai airport. I’d been trying to take everything in. Here it was, my new home Mumbai. Madcap, colorful, dirty, amazing. And apparently hilariously straight forward and matter of fact. After walking out of the airport and losing the ability to see due to the humidity hitting my glasses and fogging them up, I got a reality check. As we drove into our new city, I kept wondering: How can an American raised in South Carolina, used to living in New York, adapt to this environment? I let that marinate as we drove past the construction, the families of 5 crowded onto one scooter and the buses with dozens of faces starting back at my own. We were only on the highway and I was already overstimulated. But then Daniel pointed out the bumper sticker. And the feeling of being overwhelmed and exhausted from traveling was overtaken by the sheer excitement of living in a place that could be so many contradictions at once. As we continue driving in, the most glaring thing I notice about Mumbai is that the disparities everyone talks about when India is mentioned are so overt its shocking. It’s not just that some people are wealthy and others are impoverished – it’s that two cities are co-existing and growing together, like two plants in the same pot. The seemingly brand new gleaming glass Price Waterhouse Coopers building is in between two dilapidated buildings. The whole city is one big construction boom with modern towers coming up inside of shaky scaffolding and built by cranes with the paint peeling off. 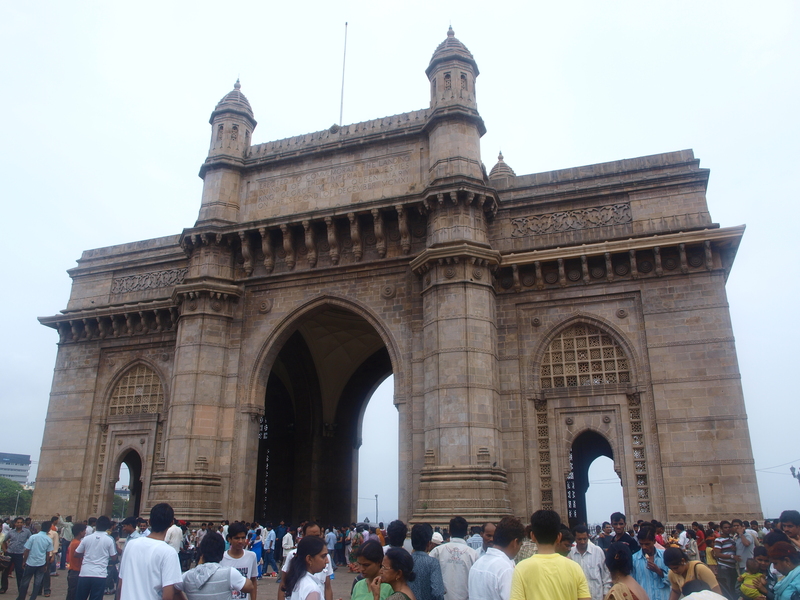 Mumbai’s modernity fights with it’s past right in front of you. As I’m thinking this, looking at a sleek highway with a shantytown under it, I am jolted. A young girl has just pressed her face against our car window and she’s staring at me, hoping for money. I look down – everyone I’ve spoken to has warned me that this will be the hardest thing to adapt to. How can anyone say no to helping a child staring at you? “But you have to just say no”, I’ve been told over and over again. “The money won’t go to them”, “It keeps the cycle of poverty” “you’d go broke”. I heard it all from the comfort of Manhattan. Nothing prepares you for it. So I just don’t look. And when we drive away I look at the window and see there’s a smudge from where her face was – it’s there for the rest of the day, a constant reminder that I’m entering a world that, for an outsider like me, will be infinitely more complicated and difficult than the one I left. We arrived at our guesthouse in Mumbai’s suburb of Bandra and I was happy to put down my belongings and rest for a moment. Wireless internet. Bottled water. Air conditioning. The city of contradictions had quickly made me a contradiction – one moment you worry about all the difficulties you’re seeing right in front of you. The next you’re thanking your lucky stars that you’ve been allotted the amenities you crave. We left before we our jetlag coerced us into napping. We drove to South Bombay and stopped at the Gateway of India, Mumbai’s own Statue of Liberty of sorts, the first thing a ship would see from the Harbor. It’s a remnant of the city’s British past but today it is pure India. 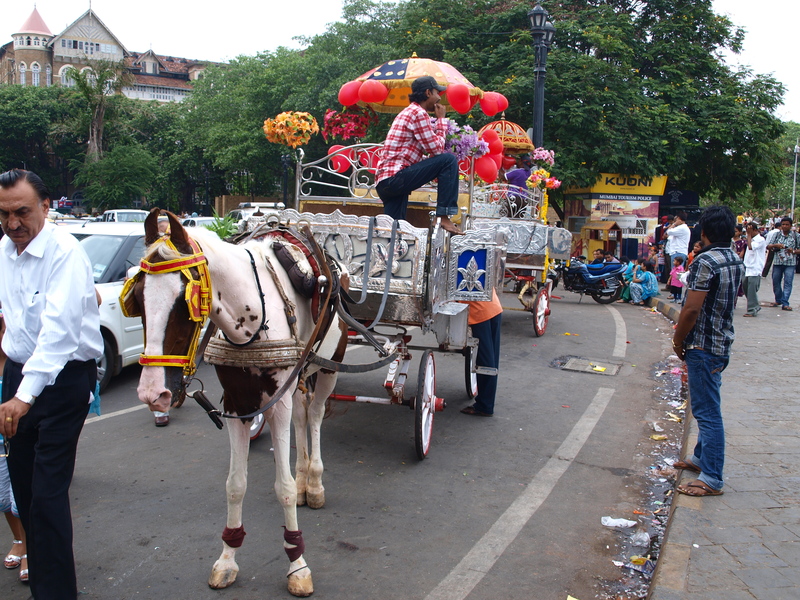 Indian tourists cram in to take photos while vendors sell food and horse carriage drivers try to recruit passengers. We finished our day driving through the neighborhoods of the Southern end of the city – I was surprised to see that this area was still just as busy and hectic as the rest. I’d read that the house prices, in relation to per capita income, are the most expensive in the world. Yet the constant construction, the sleek buildings next to crumbling relics, the new spas next to abandoned unfinished concrete — it was still there even in the mecca of Mumbai real estate. It made me love the city a little more. We drove back to Bandra over the sea link, which connects the southern part of the city to it’s north. I laughed when I realized it looks just like Charleston’s new Cooper River Bridge. A little piece of home connecting Mumbai together. It’s a lot for one day. And even that long rambling explanation doesn’t even come close to covering everything I saw. But that’s what you get from one day in India – a lot of observations and not a lot of time to gestate. But I’ve got that time laid out in front of me. I’m excited for the year – still a little overwhelmed, but ready for tomorrow. you two (three? Phoebe?) are amazing. missing you already. keep the multimedia posts a-comin. Ali, I am your cousin who lives in Atlanta, A. Phyliis and U. Lou’s daughter…..I am loving your blog…What an amazing experience and opportunity….i will look forward to reading about all of your adventures…another cousin of yours, Karen Tanenbaum is in New Dehli for the summer. Hope you guys can connect…Enjoy it all!! This blog title is the best pun of 2010! Looking forward to reading this.